October 19, 2011 - Boeing began building the first Next-Generation 737 at the program's new production rate of 35 airplanes a month. The rate is increasing from 31.5 airplanes a month to meet worldwide market demand for the best-selling single-aisle airplane. Employees loaded chords and webs manufactured by the Boeing Fabrication division into the company's newest automated spar assembly tool, the first visible step in the final assembly of the airplane. The parts were then joined to make a spar, the main support structure for the wings. "The start of spar assembly today demonstrates the progress the 737 team has made," said Beverly Wyse, vice president and general manager of the 737 program. "This is part of the series of rate increases to meet customer demand for the most popular airplane in aviation history." 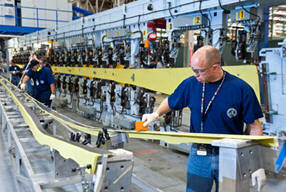 Boeing has taken a three-fold approach to prepare for the rate increases on the 737 program. The company is making production processes more efficient by working with employee process improvement teams, increasing the production capacity with capital investments such as a new wings system installation line in the Renton factory and making the site footprint more efficient by moving some production areas, expanding others and decommissioning outdated equipment. The automated spar assembly tool used to build the first spar is the ninth such machine at the Renton factory, drilling about 1,700 holes and inserting fasteners to make the spar. The tool increases the 737's wing-building capacity and is an example of one of many facilities changes happening at the Renton site to increase capacity and prepare for rate increases. The 737 production rate will increase to 38 airplanes a month in the second quarter of 2013 and to 42 airplanes a month in the first half of 2014. The Boeing 737 is a short- to medium-range, twin-engine narrow-body jet airliner. Originally developed as a shorter, lower-cost twin-engine airliner derived from Boeing's 707 and 727, the 737 has developed into a family of nine passenger models with a capacity of 85 to 215 passengers. The 737 is Boeing's only narrow-body airliner in production, with the -600, -700, -800, and -900ER variants currently being built. The 737 series is the best-selling jet airliner in the history of aviation. The 737 has been continuously manufactured by Boeing since 1967 with 6,819 aircraft delivered and 2,109 orders yet to be fulfilled as of June 2011. 737 assembly is centered at the Boeing Renton Factory in Renton, Washington. Many 737s serve markets previously filled by 707, 727, 757, DC-9, and MD-80/90 airliners, and the aircraft currently competes primarily with the Airbus A320 family. There are, on average, 1,250 Boeing 737s airborne at any given time, with two departing or landing somewhere every five seconds. On July 20, 2011, Boeing announced plans for a new 737 version to be powered by the CFM International LEAP-X engine, with American Airlines intending to order 100 of these aircraft. Boeing's board of directors is expected to vote on whether to accept the reengining proposal in late August. Internally, a minimum change version with 66-inch fan Leap-X is the probable final configuration for the proposed reengined 737, and is expected to give a 10-12% improvement in fuel burn. A service entry in 2016 or 2017 is expected, with the new models probably being designated 737-7/-8/-9, being based on the 737-700/-800/-900ER respectively. On August 30, 2011, Boeing confirmed the launch of the 737 new engine variant, called the 737 MAX with 496 order commitments from five airlines. Its new CFM International LEAP-1B engines are expected to provide a 16% lower fuel burn than the current Airbus A320.